“Clontarf Castle” they said, “Dr. Marc will be there” they said…. “So will I” I said….so off I toddled to Dublin last Monday 18th April (sorry it took so long, Wexford Skin Clinic is very very busy!) for the Image Skincare Worldwide Launch Party. Every year Image Skincare, keeping up with the latest technology and ingredients available, launch exciting new products and this year did not disappoint, in fact it blew us away… Us meaning that I was joined by my fellow Skin Therapists, Emily from Rejuvenate Advanced Skincare & Laser Clinic in Kildare and Maeve from Beauty Within in Kerry. Every year, the new products being launched are kept very hush hush which adds to the anticipation. 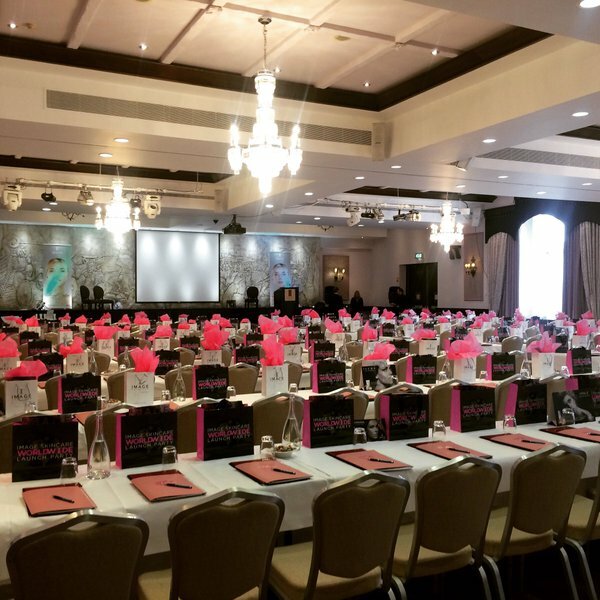 When we arrived at Clontarf Castle and seen the room all decked out with pink goodie bags and white linen table cloths, we were bursting to get started! Jennifer Rock, brand ambassador for Image Skincare got the show on the road with her never- waning enthusiasm. Before kicking off with the #newIMAGEproducts we were first introduced to Dr. Marc Ronert, co-founder of Image Skincare, along with his wife Janna. Having worked with Image Skincare for 4 years it was great to finally meet Dr. Marc. Besides being responsible for the fastest growing cosmeceutical in the World, Dr. Marc also is the president and medical director of the Care for Skin Foundation, which provides reconstructive surgery to those in need in Third World countries… So a percentage of your spend on Image Skincare goes towards this charity!! This year, Image had 8 new products to launch! Jennifer Rock kicked off with the Max Stem Cell Neck Lift Creme. All senses were fired up with her before and after pictures of “Mary” who had used the cream for 6 weeks….VERY impressive (see said pics on our Instagram & Twitter pages)!! On trial in independent laboratories, this cream was found to boost collagen by 69% and a 10% reduction in sagging….imagine, a cream that fights gravity!! Wexford Skin Clinic’s Mammy is trailing this one, so stay tuned for our own updates! Next up we had the Clear Cell Restoring Serum and Clear Cell Mattifying Moisturiser. The Clear Cell range is for oily/acne skins and I have seen such amazing results in clinic with the existing Clear Cell products so we can’t wait to get our clients started on these! Both the serum and moisturiser contain Vitamin B6 derivative which minimises pore size, shine and sebum production (50% less in 4 weeks they say…in 1 week, I’m definitely noticing my 3pm oil fest is reducing!!) whilst also calming inflammation and irritation. Two other very exciting things about these products… They can be used while pregnant and also these products were specifically formulated for the Irish market….yes little old us, on our tiny island have that much say…we shouted, Image listened!! Then along came the Vital C Hydrating Facial Oil…if you’ve been to Wexford Skin Clinic, you’ll probably know I’m not a big fan of oil on the face, but now I have to eat my hat! In our goodie bags, there she was, ready and waiting for me. I cleansed my skin with my Vital C Cleanser and Iluma Brightening Powder and 2 drops into my hands, onto my skin and I melted!!! This can only be described as delicious. Worried about how my oily skin was going to cope with this, I needn’t have, my skin loved it! This oil brings back radiance in dull, tired looking skin. Moringa, sea buckthorn and grapeseed oil, as well as stabilised anti-oxidants, brighten and help revitalise ageing skin. Next up we had a break, where we were served, fresh fruit salads and smoothies…. The Image girls were looking for a model to showcase one of their new facials…given that I’m from the model county (surely that makes me model material) and I had my Jane Iredale Mineral Make-up in the car, I donated my face for the Antioxidant, Anti-Aging Facial (watch out for our May Special on this one )!! My skin was pumped full of Image stable Tri Vitamin C blend, hydroxy acids, plant derived stem cells and hyaluronic acid and boy was I glowing!! After lunch, we were introduced to the I Rescue Post Treatment Recovery Balm. While there are many recovery balms on the market, most of them are based on petroleum…petroleum is toxic, our livers cannot break it down, so no more Vaseline on the lips ladies! Instead Image use Beeswax and organic ingredients to hydrate and reduce discomfort, redness and irritation. Only in clinic one week and already my clients are loving this product after their peels and microneedling treatments. A must for very sensitive reactive skins! We all know the hydration benefits of coconut water, right? Now we have those benefits for our eyes!! Say hello to the I Beauty Flawless Rejuvenating Eye Pads, these are the bees knees!! Not only do they hydrate and smooth fine lines, but they also remove eye make-up. We love multi-functional products!! Next up, we were introduced to make-up artist to the stars, Michelle Regazolli Stone aka Mrs. Makeup to apply the new I Prime Flawless Blur Gel and I Conceal Flawless Foundation to her model (they didn’t ask me to do this one lol)!! Our make-up is sitting on our skin for approximately 12 hours a day so make sure it’s a good one, avoid things like talc and other irritating ingredients! The I Prime Flawless Blur Gel provides hydration and moisture for the skin whilst also evening out skin, filling wrinkles (yes please) and pro-longing life of make-up! The I Conceal Flawless Foundation is illuminating, lightweight and water-resistant and contains Argeline which is said to mimic Botox. Mrs.Makeup seemed impressed so we’ll be testing it against our Jane Iredale to see which we prefer….watch this space! All in all, it was such an impressive day in Clontarf Castle with all these new products from an exciting and innovative Skincare company. Ireland has the highest sales of Image Skincare in the World after North America, how impressive is that?!! Ireland is loving Image Skincare and in Wexford Skin Clinic I am very humbled to see such amazing results every day and it makes my job a joy!